The cruciform ligament of atlas (cruciate may substitute for cruciform) is a cruciate ligament in the neck forming part of the atlanto-axial joint. 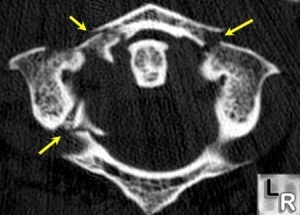 The ligament is named as such because it is in the shape of a cross. Transverse band: attaches to the inner margin of the C1 (atlas) lateral masses on both sides. stability dependent on degree of injury and healing potential of transverse ligament. Type I Isolated anterior or posterior arch fracture. 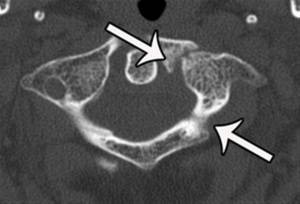 A "plough fracture is an isolated anterior arch fracture caused by a force driving the odontoid through the anterior arch. Stable. Treat with hard collar. Type II Jefferson burst fracture with bilateral fractures of anterior and posterior arch resulting from axial load. Stability determined by integrity of transverse ligament. If intact, hard collar. If disrupted, halo vest (for bony avulsion) or C1-2 fusion (for intrasubstance tear).. Type III Unilateral lateral mass fx. 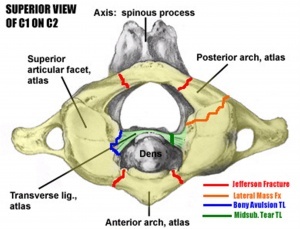 Stability determined by integrity of transverse ligament. If stable, treat with hard collar. If unstable, halo vest. Anatomy of Spinal Vertebrae Tutorial Archived 2007-10-10 at the Wayback Machine. Federative Committee on Anatomical Terminology (1998). Terminologia anatomica: international anatomical terminology. Thieme. pp. 27–. ISBN 978-3-13-114361-7. Retrieved 17 June 2010.